Approximate Location: Lat. 40-40 N, long. 70-25 W.
On July 23, 1942, a flight of U.S. Navy Kingfisher aircraft were on a training flight over the Atlantic off the coast of Rhode Island when they encountered what the navy termed “extremely bad weather”. As the planes continued on visibility dropped to near zero. One of the planes was piloted by Ensign Harold W. Gray. Upon entering the weather system, the flight leader signaled to Gray close in tighter which he did, taking a position to the leader’s right. The leader wanted Gray to be able to keep him n sight as visibility dropped. The flight leader went on instrument flight shortly afterwards, and at this time the planes were only 500 feet above the water. The leader began a shallow turn to the right, and as he did so, Gray elected to slide his aircraft up and over the tail of the leader to take a new position on the leader’s left. Gray’s aircraft disappeared into the scud and was never seen again. Also lost in the accident was Lt. Jg. William Boddie Bartels of Memphis, Tenn. 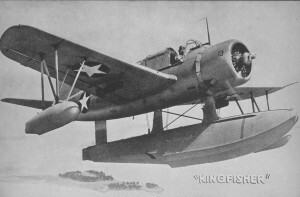 The aircraft was an OS2U-3 Kingfisher, Bu. No. 09404, assigned to Quonset Point Naval Air Station, VB-9.